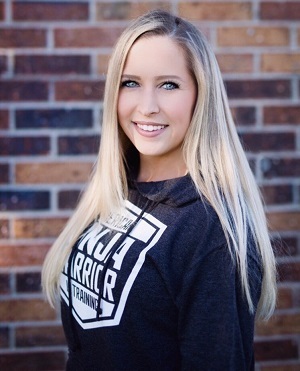 Ninjas In Training : Cristin! Welcome to the second installment of Ninjas in Training! The true beauty of Ninja Warrior is that it requires such a huge cross section of skill-sets, and so everyone tackles their training in a completely different way. We’ll be asking friends of the site to share with us their approach. Cristin, thank you so much for this interview! We met at Chicago Ninja Academy and kinda bonded while we were watching all our new crazy friends tackle these obscenely hard obstacles… were you pretty much hooked after that first session or did it take a little bit to grow on you? Absolutely! I was hooked from the very beginning! The moment I first got on the obstacles, I knew I had found my newest passion. It really didn’t take long at all for me to fall in love with ninja warrior. What made you first want to take on American Ninja Warrior as a challenge? 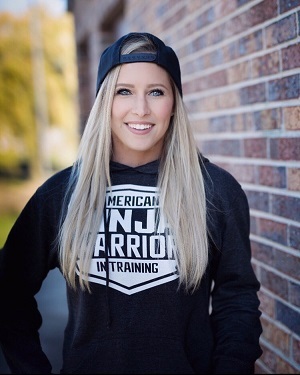 I’ve always had an ability for obstacle courses, agility and upper body challenges and have been a long-time fan and supporter of American Ninja Warrior. I always thought trying out the course would be such a cool opportunity. Then I decided – why keep wishing, why not make it happen? That’s when I visited Chicago Ninja Academy for my first time and knew I wanted to truly be dedicated to the sport and take it to the next level. Like myself, you competed in a couple of the National Ninja League competitions? How did you go? I had a great experience competing in the NNL competitions. I took a leap of faith and decided to sign up for my first NNL comp in January at Shinobi Fitness in Illinois. I ended up placing right behind some of the show’s seasoned veterans, nearly qualifying for the NNL national final in California. I never imagined doing so well, yet alone being close to qualifying so I knew I wanted another shot. 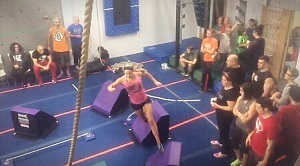 I signed up for another comp at MLab in Ohio, the gym of ANW star, Michelle Warnky. I ended up qualifying for the NNL finals at that comp! What would a normal training week look like for you? A normal week of training for me consists of 2 days a week training at the ninja gym (working on upper body obstacles, balance, agility, strength and stamina) ; 1 day a week rock climbing and bouldering to work on my grip strength and upper body endurance; 2 days a week at a regular gym doing weight training, cardio and plyometrics ; and 1 day during the week where I take off completely as my “rest day”. I do a lot of stretching, rolling out, massage / laser therapy, chiropractic adjustments, etc. Rest is a huge part of the process of recovering and repairing so I’m ready to go hard again the next week. Definitely a big year ahead for me – I have a lot planned! 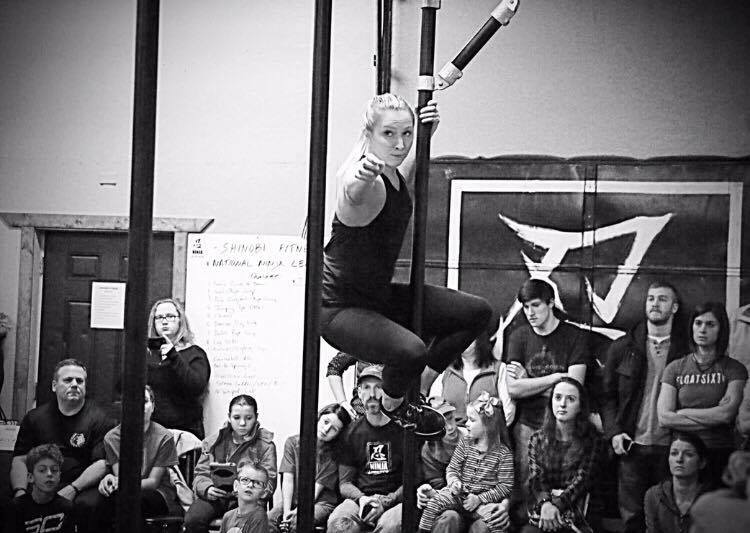 My biggest goal is to get the call from the producers to compete at the regional qualifier for season 9 of American Ninja Warrior! I will also be entering some local competitions as well as starting earlier in the year entering into the National Ninja League Qualifiers for season 3. I plan to step up my training regimen and take my fitness to a whole new level. Big things will be happening this year and I can’t wait! Diet plays a huge role in my training. I look at food as a source of fuel for the way I train – so I make sure to put enough of what I need into my diet. I try and eat the right foods and keep hydrated so I’m able to perform and train at my best. I eat a low fat, high carb and high protein diet – I’ve found that works best for me. It’s all about moderation. I know when I eat well, I feel my best, and when I’m at my best, I’m allowing myself to get the most out of my training! Australian Ninja Warrior is still very new and hasn’t aired on television yet, do you like how established American Ninja Warrior is or do you wish you could go back to the start when it was fresh but nobody knew what they were doing? I love that ANW is so established and has such a huge following. Because of that, I have such a huge support base and so many people who are interested in my training. ANW draws a lot of fans and the overwhelming support to the competitors is what makes the show so successful, in my opinion. I hope Australian Ninja Warrior takes off in the same way that American Ninja Warrior has! 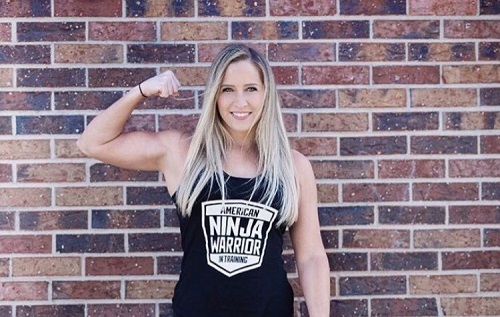 Do you have any advice specifically for girls that might be interested in training for Australian Ninja Warrior? My advice for girls or women who have any slight interest in training for Australian Ninja warrior is to JUST DO IT! It’s hand-down one of the greatest decisions I’ve ever made for myself. I’ve gotten into the best shape of my life and have made the most amazing group of friends (who have become like family) throughout the whole process. The ninja warrior community is absolutely incredible. I’ve been so lucky to make ninja friends from not only around Illinois, not only around the country, but from around the world too! I truly stand by the quote – “don’t wish for it – work for it!” Don’t look back and regret the chances you never took, be brave and take them! Thanks so much Cristin, if peeps want to follow you and all your adventures, what should they hit? You can follow me in Instagram at: @cristin.colleen_fit, where I post a lot of content about my training and my amazing journey that I’m on! Thanks again to Cristin for sharing her training, goals and progress. We wish her the best of luck to smash out 2017. ← Fantasy Sports and Ninja Warrior – together at last! → Ninjas in Training : Krispy Ninja!